“Gender diversity in business is directly linked to increased creativity, collective intelligence and financial performance. … It’s no surprise then that many of our country’s most innovative companies are instituting new policies to invest in women leaders,” wrote Orrick Chairman Mitch Zuklie in a Fortune op-ed about our industry-leading parental leave program. Social research confirms the positive impact on business when organizations have three or more women on their board of directors. 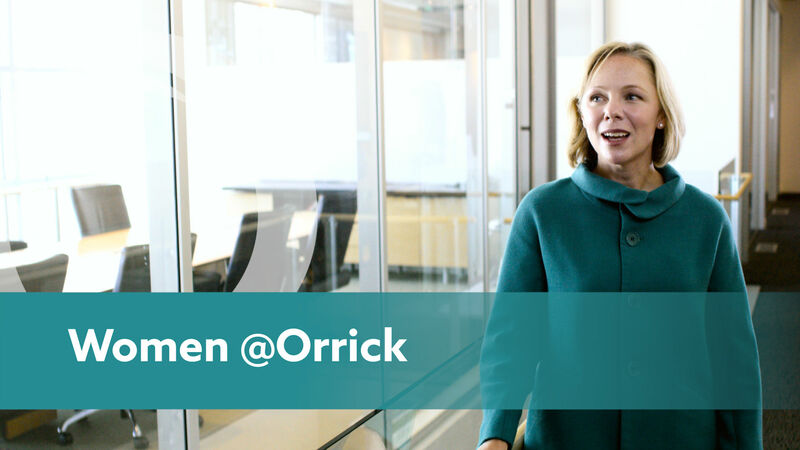 At Orrick, women have a strong voice in the leadership of our firm. We are fortunate to have five women on our Board and Management Committee. And women lead or co-lead two-thirds of the firm's 45 most valued client relationships. Yet we know there is more we can do to advance women at our firm. To guide us, our Women’s Initiative is led by Leah Sanzari. To draw on the best thinking from inside and outside our firm, we have created a Women’s Leadership Board composed of leaders in business and law. Members include senior leaders from Facebook, Kleiner Perkins, NVIDIA, Oracle, Paypal, RPX Corp. and Total. Collaborating on this initiative is Kellie McElhaney, adjunct professor at UC Berkeley’s Haas School of Business and founder of the Haas Center for Responsible Business. Leah Sanzari, a partner in Orrick’s New York office, acts as counsel to issuers, underwriters, servicers, placement agents and investors in connection with both public offerings and private placements. She has experience in a wide variety of asset-backed securities, with a particular emphasis on residential mortgage transactions, esoteric assets including tax liens, PACE liens, structured settlements and lottery receivables, resecuritizations and collateralized bond obligations and collateralized loan obligations. Leah has worked with numerous borrowers and lenders on financing and warehouse facilities for mortgages and esoteric assets and has represented both sellers and buyers of portfolios of assets, including mortgages and esoteric assets. Leah advises a number of financial institutions and government agencies with regard to the implications of financial markets regulation, as well as in connection with complex capital markets, debt financing and other transactions. She is a part of the Financial Institutions Industry Group, a multi-practice global group of partners who have client relationship responsibilities for financial institutions around the world. She is Co-Chair of Orrick’s Women’s Initiative and Chair of the Esoterics Committee of the Structured Finance Industry Group, a member-based, trade industry advocacy group focused on improving and strengthening the broader structured finance and securitization market. Orrick is honored to once again be named one of the “Best Law Firms for Women” by Working Mother magazine. This is the firm’s 10th time on the list. "The best talent want to be the best parents and we need to have policies that support that, because they’re overachievers in every way, including parenting."